The Algoma Niagara is the first ship into Goderich Harbour, kicking-off the 2019 shipping season. The ship arrived on April 2, 2019, captained by Capt. Chesley Thorne. 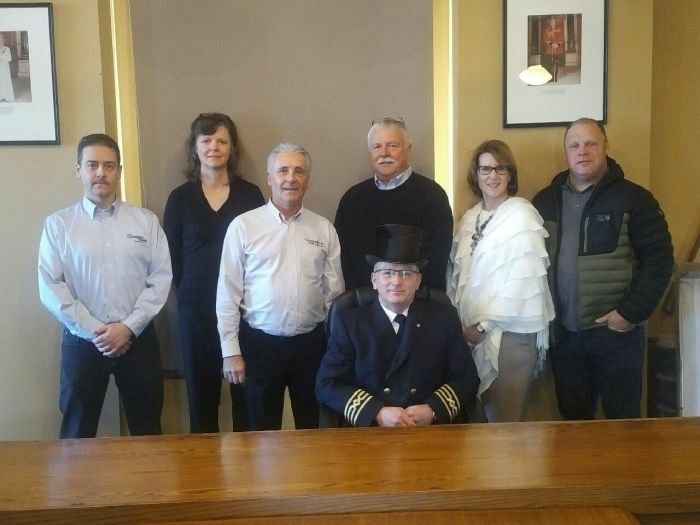 It is a long-standing tradition in Goderich that the Captain of the first ship in the harbour in the spring is greeted by Council, municipal staff and local industry representatives upon arrival. The Captain is also presented with the Town's top hat and treated to dinner. Captain Chesley Thorne receives the traditional top hat from Mayor John Grace. Council, staff and industry representatives welcomed Capt. 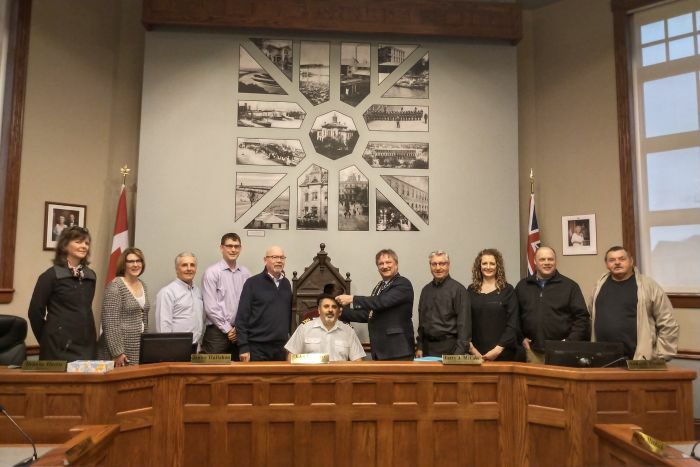 Thorne to Council Chambers on April 2, 2019. 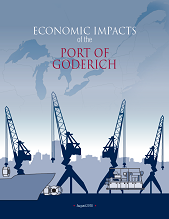 GODERICH – According to a new study, activity of the Port of Goderich supports 2,774 jobs. Inaddition, the study found that maritime commerce on the waterway in 2017 supported $397.9 million in economic activity, $57.5 million in annual personal income, and $76.2 million in federal and province tax revenue. The comprehensive study, “Economic Impacts of Maritime Shipping in the Great Lakes-St. Lawrence Region” was commissioned by the marine shipping industry in partnership with government agencies, including the St. Lawrence Seaway Management Corporation, the Chamber of Marine Commerce, Transport Canada and more. “While there has been consistent interest in the Port, the shortage of land has been a barrier to increased industrial development. We are now in a position to encourage further industrial development on the expanded port, and hope to move forward to approaching senior levels of government in an effort to identify a supporting financial partner for the up to $40 million of required investment for an additional 15 acres of land.” Says Larry McCabe, Chief Administrative Officer for the Town of Goderich. The study measured the effects of cargo movements in 2017 at Great Lakes ports, including employment, personal income, business revenue, local purchases, and federal, provincial, and local taxes. Locally, 788 jobs were directly generated at the marine terminals at the Port of Goderich and another 1,423 of induced jobs contributed to the local economy. In 2017, ports and marine terminals on the Great Lakes Seaway System handled 285 million metric tons of cargo valued at $15.2 billion. This cargo included grain, iron ore, coal, manufactured iron and steel products, heavy lift/project cargoes, and salt. The local data is attached and the full study can be found here. The study, which uses 2017 data was carried out by respected economic consultants Martin Associates of Lancaster, Pennsylvania. Martin Associates was retained to perform this analysis by a coalition of U.S. and Canadian Great Lakes and St. Lawrence marine industry stakeholders. A steering committee including the Saint Lawrence Seaway Development Corporation (U.S.), The St. Lawrence Seaway Management Corporation (Canada), the American Great Lakes Ports Association, the Chamber of Marine Commerce, the Lake Carriers’ Association, the Shipping Federation of Canada, Transport Canada, the St. Lawrence Economic Development Council (SODES), and the St. Lawrence Ship Operators Association provided confidential data, guidance and oversight for this study. The Chamber of Marine Commerce’s (CMC) second Marine Day on the Hill Reception, held on Oct. 16 in the Wellington Building. The night was the capstone event to the lobby group’s Marine Day on the Hill, where it spoke to members of the House Transportation Committee and Transport Minister Marc Garneau, who gave greetings and remarks at the event. From the Town of Goderich Larry Macabe, CAO and Chip Wilson (Director of Operations) attended with Rowland Howe President of GPMC. 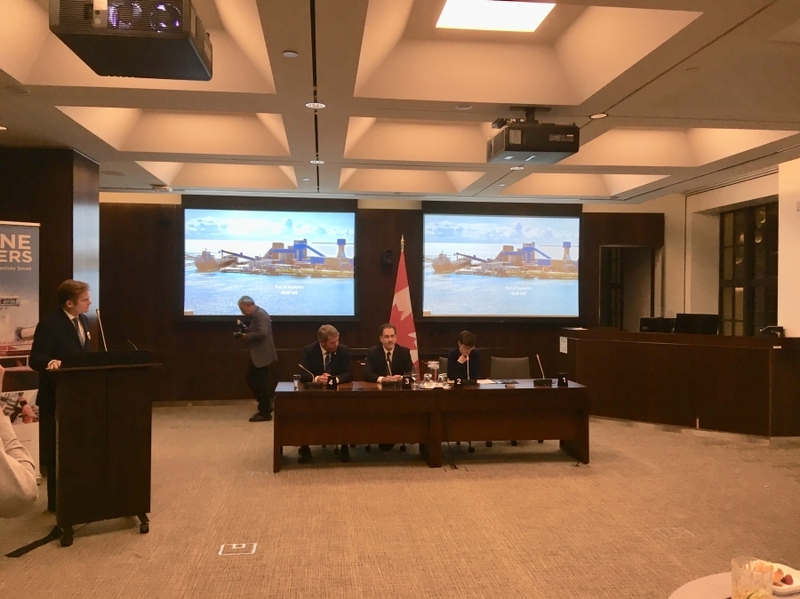 After remarks from Mr. Garneau, Liberal MP Vance Badawey, NDP MP Brian Masse, and Conservative MP Kelly Block joined for a multi-party panel on marine transportation, moderated by CMC president Bruce Burrows. The shipping season for 2018 is off to an early start, with the first ship arriving in Goderich Harbour on Sunday, March 25 at 1 PM. The CSL Laurention arrived in Goderich Harbour with a load of cargo for the Parrish and Heimbecker (P&H) Goderich Elevator. Captain Joseph Pero, as captain of the first ship of the season to reach Goderich Harbour, was presented with the traditional top hat. Captain Pero was greeted by representatives from the Town of Goderich, Goderich Port Management Corporation, Compass Minerals, and Goderich Elevators. 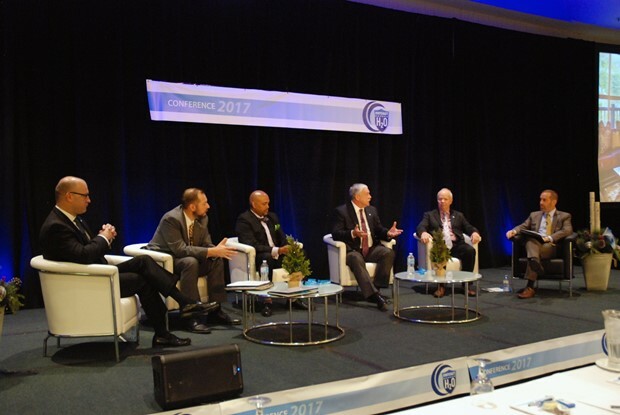 The President of GPMC, Rowland Howe, recently participated in a panel discussion at the 2017 HWY H2O Conference in Toronto. The conference is an annual event hosted by the St. Lawrence Seaway Management Corportation. At the conference, operators and shippers gather to discuss commerce throughout the St. Lawrence Seaway System and beyond. The event was a great opportunity to tell the story of the Goderich Port and highlight the expanded opportunities for shipping through the harbour as a result of the construction of a new dock and the wharf expansion. Recently, GPMC was notified of the potential presence of giant hogweed around Snug Harbour. GPMC consulted with staff at the Town of Goderich, who identified the plant as angelica. Should you suspect the presence of noxious weeds around the Port, please do not hesitate to contact us. The first ship of the 2017 shipping season arrived in Goderich Harbour, Wednesday April 5th at 9:30 p.m. Traditionally, the Captain of the first ship is welcomed to Goderich Town Hall for the presentation of the top hat and dinner; however in a break from tradition, this year's ceremony was held aboard the Robert S. Pierson. 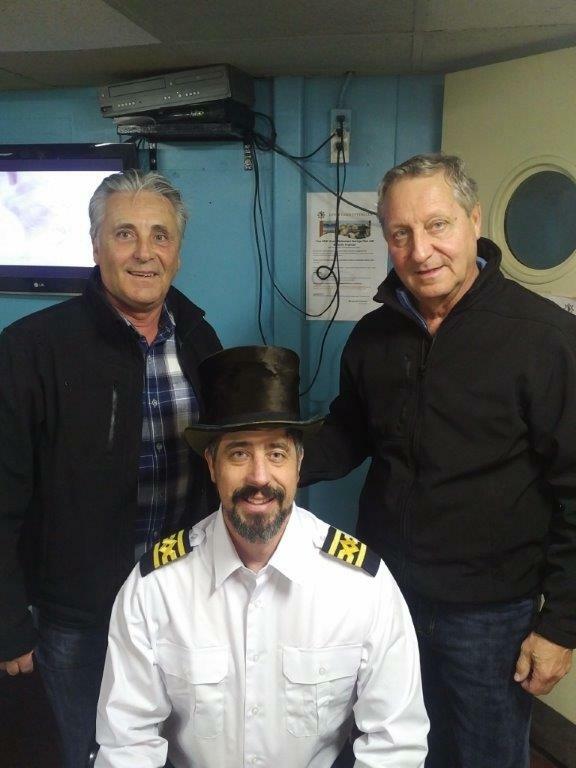 Town of Goderich CAO Larry McCabe and Director of Operations, Chip Wilson, presented Captain Ted Brown with the top hat. After taking on a load of salt, loaded over night, the Robert S. Pierson and her crew left for Detriot. A sure sign that spring is on its way to Goderich is the annual Top Hat Ceremony. Neil Olsen of the Cpt. Henry Jackman was the latest to add his signature to the top hat on Tues., Apr. 7 after rolled in the previous evening. 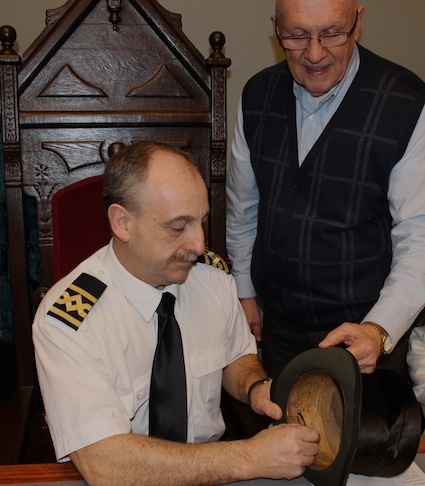 As is tradition for the captain of the first vessel to arrive and load a cargo each year, Olsen signed the symbolic top hat during a ceremony held in town council chambers. This is the second time Olsen was involved with the ceremony as he captained the Algoway in 1999 as the first ship to arrive in the Port of Goderich. The ceremony has long been a part of Goderich’s history. In 1932, after a time of absence, the council of the time restored the ceremony and for the past eight decades, the tradition has carried on. Up until the early 1980s, the first ship of the year arrived in April more times than not. However since 1988, an April arrival has happened only five times, however, it is has occurred in the past three years. Olsen said the ice on Lake Huron wasn’t as bad as last year, but still presented a challenge. “Usually it takes us about five hours to arrive from Sarnia, this time it was eight hours,” he said. According to Olsen, the crew enjoys coming to Goderich because of the convenient location of the port. “I’ve always liked going into town, everything is right there for you,” he said. - In a nine-year period from 1988 to 1996, the arrival date was within the same five-day period each year. 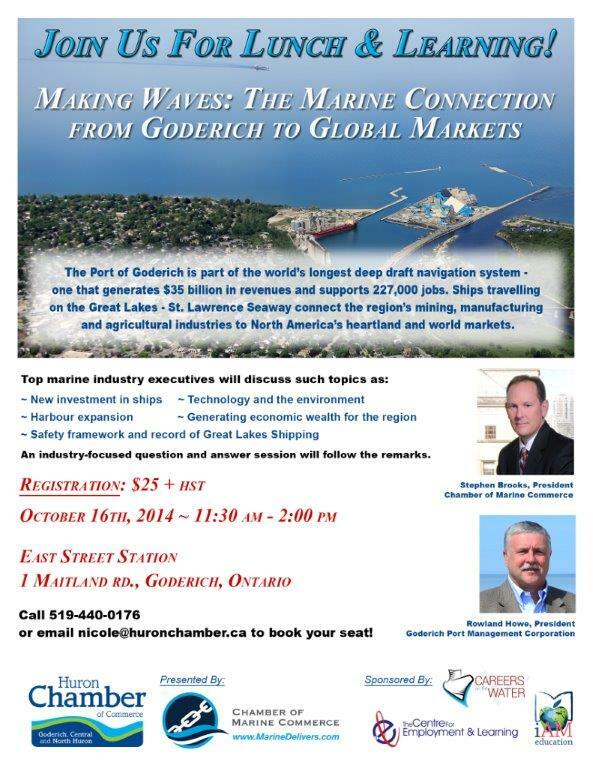 Register now for a lunch and learn session with top marine industry executives, Stephen Brooks, President of the Chamber of Marine Commerce and Rowland Howe, President of Goderich Port Management Corporation. Topics to be discussed include: new investment in ships, technology and the environment, harbour expansion, generating economic wealth for the region and safety. There will also be the opportunity to ask industry-focused questions. HEATHER BOA News Now GODERICH – Work began this week on a $2.09-million project to improve the north pier at Goderich’s harbour. Work is under way on improvements to the North Pier. “It’s an investment in one of Goderich’s greatest assets; the deep water port. It’s part of the strategy to bring it up to a high quality port to hopefully attract new cargoes,” said Rowland Howe, who is president of Goderich Port Management Corporation (GPMC), which has contracted the work to Finnbilt General Contractors Ltd. of Stratford. The contractors will extend the quay, form and pour concrete, raise bollards used to tie off boats, and finish with an asphalt top graded to improve drainage and prevent water from pooling. The project will generally raise the pier to meet future lake levels. Work will be intermittent, grinding to a halt or moving to the west end when boats are docked on the north pier in order to protect workers in the event there’s a break in the cables that tie down the boats. The contract between Finnbilt and the port corporation ensures boats coming in to the harbour are given priority. At the same time, rocks will be ferried to the north breakwall to create a dynamic berm that will help to protect the inner harbour from wave action. A contractor for that work – and its price tag – is expected to be announced shortly. This past Easter weekend, fishermen hoping to catch perch from a favourite spot on the north pier found themselves locked out after the construction company moved in equipment, even though an agreement with the town allowed access as long as there were no boats docked at the north pier. Howe said they weren’t expecting the north pier to close until after the Easter weekend, but now it will remain closed to the public and construction signs posted until the end of construction, which is schedule for November 2013. “When it’s a construction site, the public will be excluded. It’s just a requirement basically because they’re going to be digging up the actual deck of the pier,” Howe said. This work is part of a 15-year plan to restore the harbour that includes improving the breakwalls, improve piers, and infill and expand the harbour. It is funded by users’ fees collected by GPMC. “When the port was acquired from the federal government in 1999, it was identified that a lot of work needed to be done to bring it up to a decent standard. There had been a lack of investment,” Howe said. Last year, Finnbilt completed a $900,000 upgrade at the south pier, reinforcing the pier’s surface, creating a four-foot barrier with an inset wave pattern, building a wheelchair accessible walkway along its south side, providing stairs to a narrow walkway to the south of the barrier and installing LED lighting. Tiered seating was installed at its end provides a sort of gathering place. The work is part of the $47-million harbour improvement project, with funding from GPMC, the provincial government and Compass Minerals. A substantial part of the project will be the future infilling of about 14 acres off the north harbour to expand the wharf. GPMC was established in 1999 when the town bought the port from the federal government. The not-for-profit corporation of port users operates the port on behalf of the town, relying on user fees to manage day-to-day operations. Capt. Wayne Penney signing the top hat, with Mayor Deb Shewfelt. HEATHER BOA News Now GODERICH – Goderich’s mayor placed a ceremonial black top hat on Captain Wayne Penney’s head, officially recognizing the Algoma Navigator as the first boat of the 2013 season to arrive in Goderich Harbour today. Like so many mayors before him, Mayor Deb Shewfelt presented the captain with gifts from the town. Like so many captains before him, Penney signed the hat’s head band. “It’s got a lot of history behind it, this ceremony. Goderich has been a port for many, many, many years. A lot of people have come and gone and a lot of ships have taken a lot of cargo,” Penney said. He said to be the first ship in the port was an honour for both himself and the ship’s owner, Algoma Central Corporation. Penney is from “a family of ocean-going sailing people.” He has sailed for 23 years, now working two months at a time before returning home to Paradise, Nfld. for one month. His brother, Fred, sailed for 43 years. 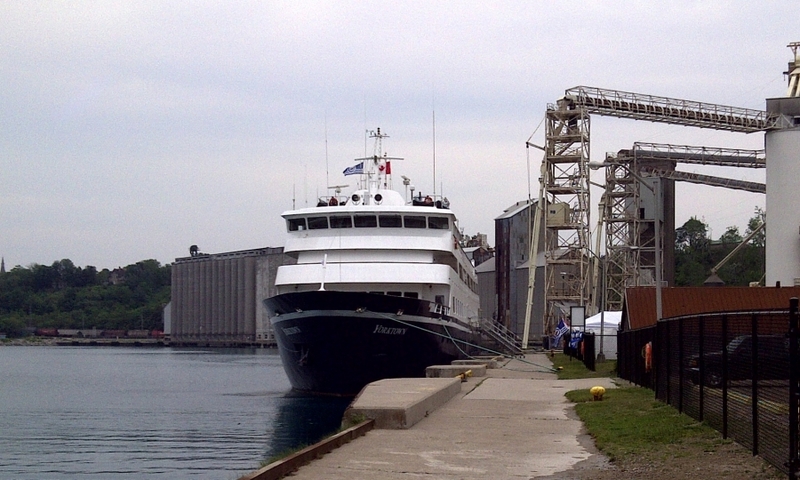 The Algoma Navigator and its 27 crew members arrived early this evening from Detroit. The ship, built in 1967, regularly transports grain, iron ore, coal, salt and aggregate around the Great Lakes. Over the next eight to 10 hours, it’s expected to load 24,000 tons of salt before heading on to Duluth, Minnesota, on Lake Superior. The Algoma Navigator is a regular visitor to the Goderich Port, and was in the harbour when the tornado hit Sifto’s salt mine and cut a swath through the town and surrounding area on Aug. 21, 2011. Goderich Port Management Corporation has recently hired a contractor to complete upgrades to the North Pier (Dock 1). The project, which will start immediately and run until approximately November 30th , is part of an ongoing program to improve facilities in the harbour. This current project will involve repairing and adding concrete as well as the placement of some gravel fill along the western section of the pier. During the construction, there will be periods when the North Pier will be closed to the public. OVERLAND PARK, Kan. (August 13, 2012) – Sifto Canada Corp., a subsidiary of Compass Minerals, today announced it has entered into an agreement with the Town of Goderich, ON, and the Goderich Port Management Corporation to expand and enhance the Port of Goderich. The plan calls for the creation of new land at the port, which would provide space for additional port traffic and would give Sifto additional storage options during the winter when the lake is closed. The project is expected to cost approximately CA$47.2 million, and will be financed in part through a CA$15.7 million infrastructure improvement grant from the province of Ontario, along with funds from the Goderich Port Management Corporation. Sifto’s additional fees, currently expected to total approximately CA$18.9 million over a five-year period, would provide Sifto with a renewable 25-year lease on the new land. The plan requires completion of an environmental assessment, which is currently underway. Additionally, successful conclusions in feasibility evaluations and additional engineering studies must be finalized. The company and the town of Goderich expect project completion in 2016. The first cruise ship of the season has arrived in the Port of Goderich. 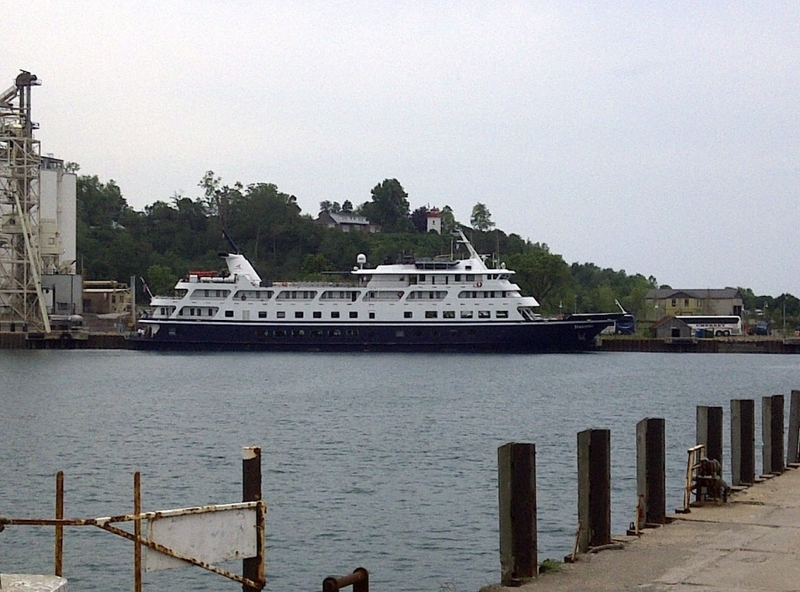 The Yorktown, and her 138 onboard guests, arrived in Goderich at 10 A.M. on June 11, 2012. The Yorktown, owned by the Great Lakes Cruise Company, is 257-feet long, 43 feet wide and with a draft of only 8 feet is well-suited for Great Lakes cruising. The Yorktown and her passengers were welcomed into the Port of Goderich by a piper, who will also see the ship off later this evening. Many passengers boarded a bus to see a performance in Stratford, but for those not going to see the play a shuttle bus will allow passengers to visit Goderich's historic Square. The arrival of the Yorktown marks the beginning of a busy cruise ship season for the Port of Goderich. 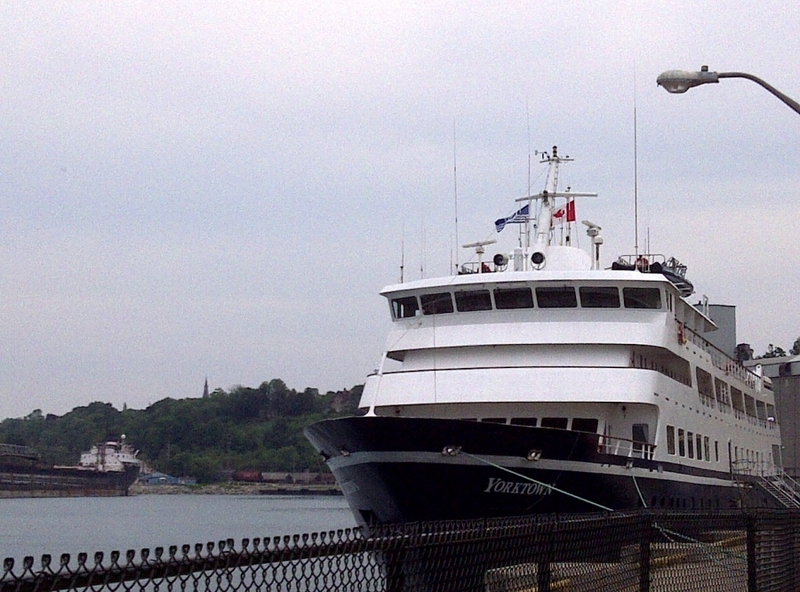 Throughout the summer, a total of eight cruises will visit Goderich. The South Pier of Goderich Harbour will undergo reconstruction this summer, with work on the pier expected to begin August 1, 2012. Part of a larger harbour expansion project, the reconstruction of the South Pier will improve the overall structure and accessibility of the pier. Rowland Howe, Goderich Port Management Director, presented a three-dimensional rendering of the planned improvements to South Pier to Goderich Council on April 16. The improved South Pier will feature an elevated walkway along the south side of the pier, as well as a concrete parapet to protect the pier from wave action. 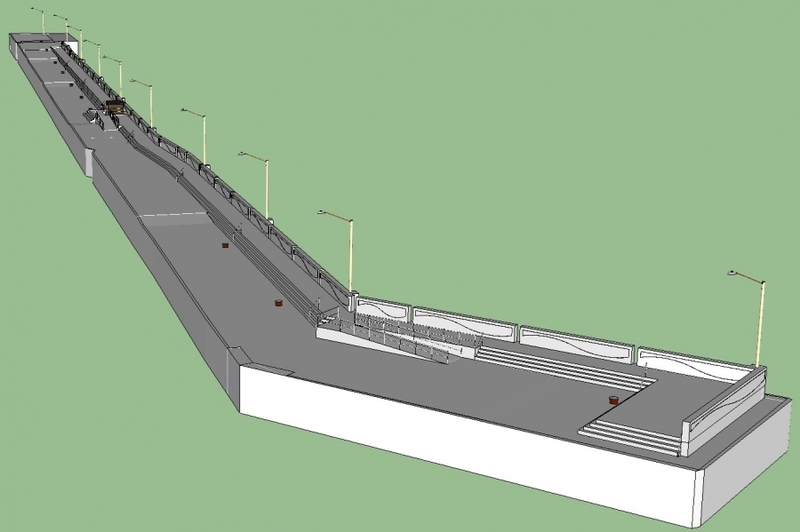 Ramps will provide access to the elevated walkway and will also double as seating. A series of bollards on the north side will allow for cruise ships and other large vessels using the harbour to tie up to the South Pier. Capt. Peter Schultz guided the Peter R. Cresswell into port Friday morning to officially open the shipping season. Deputy-mayor, John Grace, presented the ceremonial top hat to Capt. Schultz, the 81st time the ceremony has taken place. 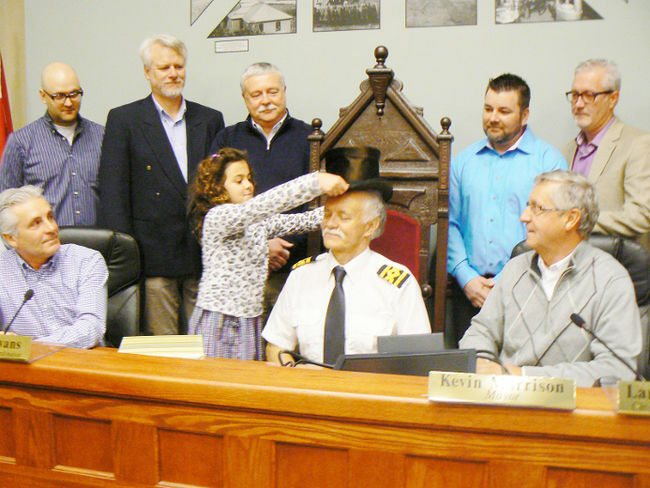 While the shipping season was never really suspended for the winter months, the first captain into port for the 2012 season was formally recognized at town hall Friday. Captain Peter Schultz guided the Peter R. Cresswell into port at 9:15 Friday morning after delivering a load of cement to Detroit. It’s the first time Capt. Schultz has opened the shipping season in Goderich and taken part in the ceremonial top hat presentation, a tradition that has endured for 81 years. Last year, Capt. Schultz had the distinction of opening the season through the Welland Canal. The Peter R. Creswell loaded with 25,000 tons of salt destined for Prescott. Capt. Schultz noted that last year the water level was +13 inches in Goderich and Friday the level was down one foot to +1 inch.